Six elephant tusks were found on the wreck site of the Henrietta Marie. They range in size from approximately twelve to thirty-six inches long. Although the primary business of the ship was to be slavery, one investor, Robert Wilson, was more interested in ivory. An Africa trader of long standing, he consigned a variety of goods to the Henrietta Marie for the trade, ranging from cases of alcohol to felt hats. For Europeans, the ivory trade long predates the traffic in people. Since ancient times, the lustrous material was imported at great expense from either Africa or India. Its prohibitive cost made it a luxury enjoyed only by the Church or the very rich. It was used for religious statuettes, and reliquaries as well as ornate combs, mirror backs, and sumptuous cylindrical boxes for jewelry and cosmetics. Europeans knew that Africa contained vast wealth but, until the fifteenth century, they lacked ships reliable enough to get there by sea. As the Portuguese improved their ocean-going capabilities, they became the first to to pick their way down Africa’s dangerous coast, lured by the ivory, gold, and spices that they knew they would find. Despite their expectations, they must have been astonished to see the elephants of the savanna grazing near the water’s edge. The tusks themselves were often enormous, reaching ten feet in length and weighing as much as 225 lbs. African traders were surely unsurprised by the Europeans desire for the tusks. They had their own regional traditions of ivory carving as well as an established trade in ivory that they had developed with Arab merchants. When the Africa trade opened up, the demand for ivory in Europe increased with the supply. Piano keys, pistol grips, billiard balls, knife handles, chess sets—anything that could be enhanced by ivory was swiftly marketed and absorbed. As the trade progressed, Europeans noticed that the elephants with the largest tusks were getting scarcer. Markets fluctuated and not every slave ship found ivory readily obtainable. The tusks from the Henrietta Marie would have been considered small. 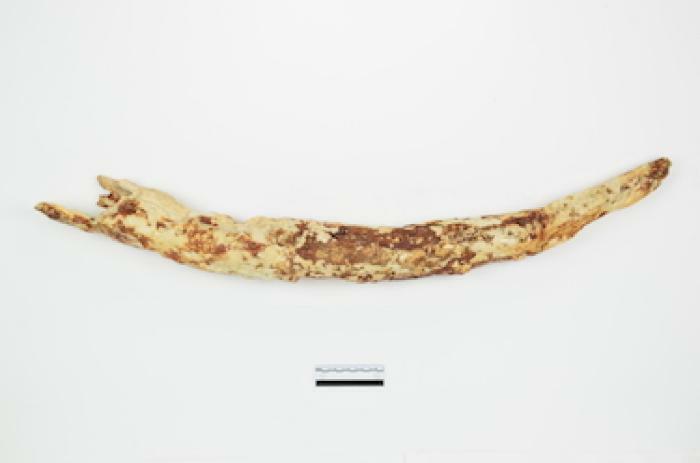 Tusks weighing less than fifteen pounds were known as “scrivelloes,” and small-diameter tusks like these were referred to as “bagatelles.” Possibly there were larger examples in the cargo and some might have been sold to colonists in the Caribbean. The trade was still growing when the Henrietta Marie took her cargo on board in Africa. William Bosman, a Dutch factor stationed at Elmina at the time of the Henrietta Marie’s voyage, wrote of a Dutch ship leaving Gabon with “three or four thousand weight of elephants’ teeth” and comments that the amount is often greater. Due to the trade, the population of African elephants has dwindled from 26 million in 1800 to between 450,000 and 700,000 today.